Make every step safer and easier by adding this flexi cane tip to your own cane. Patented tripod design flexes for stability at virtually any angle, whether you’re walking on uneven ground, rising from a chair, or getting in or out of a vehicle. 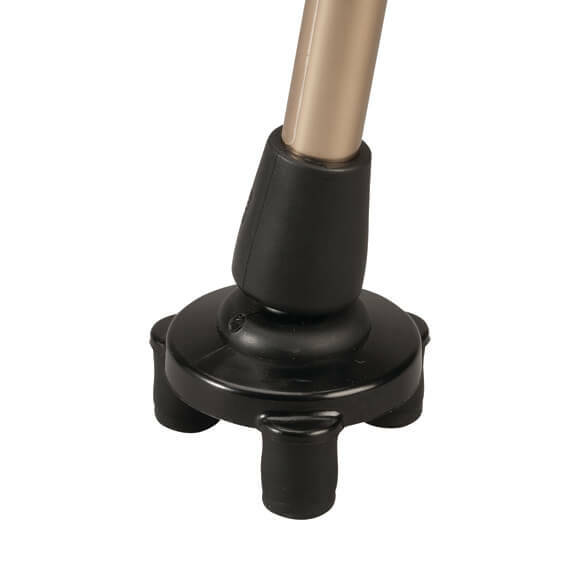 Tripod cane tip features textured feet for traction on wet or dry surfaces, and allows you to right a dropped cane by simply stepping on it. Walking stick tip measures 2 3/4”dia. x 3 1/4”H base. Fits most standard canes up to 3/4”dia. Use with 3 Tuffi Tips (sold separately) to make your cane self-standing. will my. And stand alone with the tuffi tip? Is this the Tuffi Tip to attach to Flexi Cane tip for anti-slip protection on page 3 of your catalog?